The Friday before Labor Day has long been a strong seasonal day for the market. The study below is one I also showed last year. The stats table based on buying the Thursday before Labor Day and selling the close on Friday. With 71% of the days finishing higher, a profit factor of over 2.5, and an average trade of 0.3% the stats are quite compelling. Regardless how it plays out today, I hope everyone has a great Labor Day weekend! The study below is from last night’s Subscriber Letter. 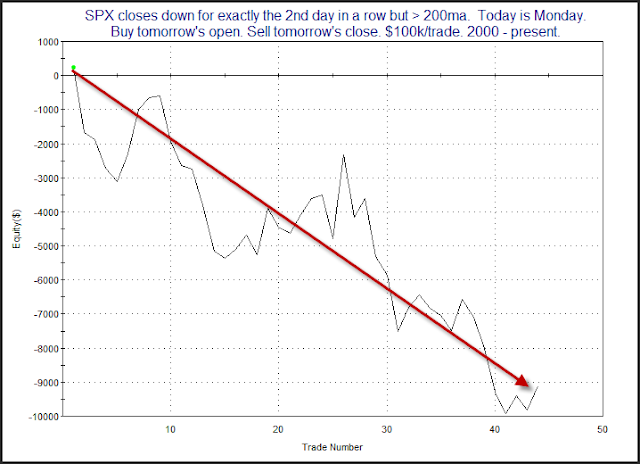 It looks at a possible reversal pattern off a 20-day low, and uses very simple criteria. Results here seem to suggest a solid upside edge. Intermediate-term lows in long-term uptrends often offer buying opportunities. And they are commonly good for more than just a 1-day bounce. SPY is looking like it could open down over 1% this morning. While a 1% gap may have been considered small in the fall of 2008, this would be only the 3rd time this year that SPY gapped down as much as 1%. 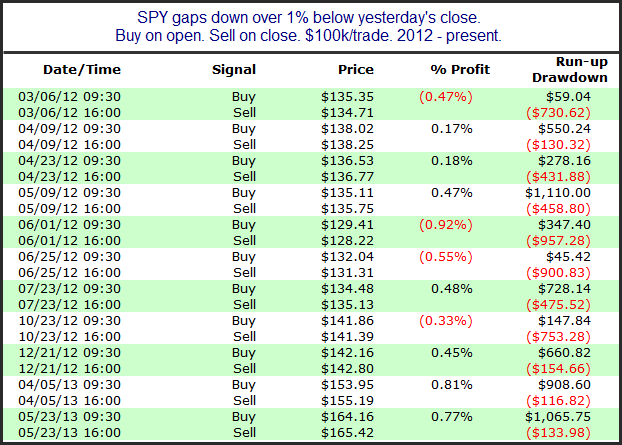 Below I have listed all 1% gap downs since the beginning of 2012, and how they fared from open to close. More often than not they have gained back some losses during the day, but it certainly has not been a lock. Good luck trading today. At Overnight Edges yesterday I noted that there was a strong bullish overnight edge when ES had made at least three consecutive lower highs, lows, and closes. I’ve also discussed in the past that Tuesdays are known for their turnaround capabilities. The study below uses SPY and it looks at swing-term implications of the 3+ days of lower highs, lower lows, and lower closes when today is Monday. As you can see the numbers are very strong. Not seen in the above table is the fact that 33 of the 34 instances closed above the entry price at some point in the next 4 days. This all points to a strong likelihood of a bounce. The study below is one that I have shown before, but not for a while. It looks at days like Thursday where SPY posts an unfilled gap down that closes poorly while the market is in a short-term downtrend, but a long-term uptrend. Results are updated. Results are strong right from the start and look good throughout the first two weeks. This one favors the bulls. No Turnaround Edge This Tuesday? Tuesday has shown strong inclinations to turn around over the years when there has been a pullback leading up to it. But when the pullback has been 2 days old and the market has been in a long-term uptrend, that turnaround inclination has not held true. Whose fault is that? Not the overnight. It's been the day session. Below is a are the results of going long Tuesday morning after a 2-day pullback during an uptrend, and then exiting at the close. As you can see, the stats show a moderate downside inclination. I also produced a profit curve to see how this has played out over time. A bit choppy, but it has been headed lower for a long time. Traders may want to be a little cautious about jumping aboard the "Turnaround Tuesday" train today. The market has historically struggled between open and close under similar scenarios. I am out of the office again today. The blog will return to normal next week. But if you cannot wait that long for some Quantifiable Edges research, below is a link to an MTA webinar I recently did. This one discussed trading edges related to long-term, short-term, and overnight trading. The MTA, which stands for Market Technicians Association, is a top-notch organization. I would recommend all traders interested in technical analysis check it out and see what they have to offer. I have been taking some time away in the last couple of weeks. And while the subscriber service has carried on as normal, the blog has suffered. I'll be back in a few days to again ramp up the blog. But for those of you who are yearning for some Quantifiable Edges, feel free to check out the presentation I did with Tradestation near the end of June. "Overnight Edges - Using Historical Tendencies to Anticipate Overnight Market Movement" - A webinar given June 18, 2013 as part of Tradestation's "Spotlight On..." series.